With the advent in technology, Wireless internet is on a roll these days. Whether it be a school, college, or a cafe, all these places are well equipped with Wi-Fi networks. So why not locate free Wi-Fi and use them to save our 3G internet bills. Isn’t that a cool idea. Here’s an Android app which will help you to locate free Wi-Fi networks in your vicinity so that you can access the internet free from there. So why pay for a internet, when you can access that free by locating the shared Wi-Fi network near you. How Free Zone Wi-Fi Works? Free Wi-Fi Zone offers it’s great service via a quite intuitive user-interface. Once you tap it ON, it’ll automatically start searching for the available networks in your vicinity. You can search for the free zone on the map or if you think that there are some Wi-Fi network might be available near you, you can choose to search for networks nearby. Without taking much of your time, it starts searching for the free, available shared network near you. After scanning all the networks, it’ll list all the networks available. Just like as if you search for a Bluetooth network, Free Zone Wi-Fi works the same way. 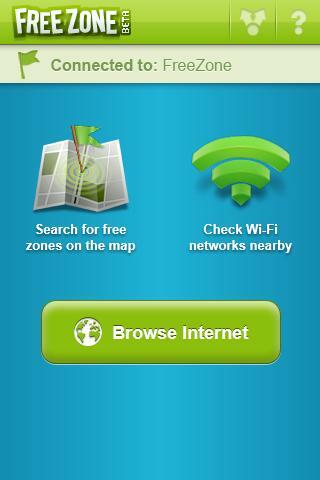 Free Zone Wi-Fi lists all the networks from which users can choose any network to use internet free of costs. The app once started, keeps running in the background, and notifies you whenever you are close to the Wi-Fi network you can use for free. It send notifications to your Facebook, Twitter and even mailed you about the recent network scan which you can use. To me, it’s quite a useful app to save few bucks which we would be paying for 3G internet bills. Free Zone Wi-Fi requires Android OS v2.1 and above to work. It’s free to download, available in Android Market. Wi-Fi Finder is another great Android app which works the same way as Free Zone Wi-Fi. Free to use, download it from Android Market, but it’s highly varies on the Android smartphone you are using to make it work. So enjoy free internet via locating a free Wi-Fi network with these two Android apps and do share how the two Android apps works out for you. What makes it different from the Wi-Fi interface of Androids? I can’t seem to figure out why I still need this one. Can it bypass security codes? That sounds like a really useful App. It’s massively annoying finding an open wifi through the inbuilt wifi scanner only to find that you need to pay for access. which country avialable it? i live in Georgia and it is not posible to use here. Hmm this app seems pretty much useless in my opinion as your phone will automatically search for wifi networks. I don’t understand why an app that does the same thing your phone is automatically doing anyway is of any use? This reminds me that how much we should take care of our wifi in home by providing necessary security and password locks. Pretty good write up for finding free wifi.. thanks. That is a pretty cool app i will have to download it and check it out.